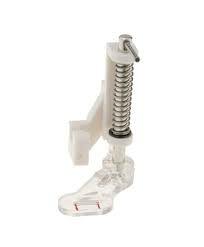 This clear plastic foot raises and lowers with the needle to allow fabric to be moved between stitches and to hold fabric in place while stitches are created. Screw on clear plastic foot has markings for easy reference. Requires Low Shank Adapter for ULT/PC series. Also known as a Darning Foot and may be used as a free motion foot.